Green Graffiti : Chew and Chuck! A couple of days back I took the ‘Intercity Express’ to Pune. In fact, it’s a train I usually travel by when I need to get from Mumbai to Pune. The timing is most convenient, you catch the Intercity at Dadar at 7.00 a.m. and you are in Pune just three hours later. The timing also makes it a ‘breakfast train’ – you have a chain of vendors continually dishing out a variety of delicacies from idli sambar to vada pav. And yes, you have the chai and coffee wallahs briskly pouring their brew from steaming kettles, offering you yet another cup, each time you are done with a sabudana vada or a veg samosa. As the train hurried along its way, I sat looking at the munching passengers – the clip-clopping of the train had got them into a happy rhythm too, chew and chuck... chew and chuck! Disposable plates and cups, plastic bags and paper napkins, aluminium cans and laminated sachets... all sent sailing merrily through the window! When the lady sitting opposite me was about to chuck her refuse out of the window, I viciously grabbed it out of her hand. She gave me a horrified look, probably thinking I was some kind of psychopath, who had the fetish of collecting discarded waste! Well, I don’t want to get into a discussion on how we have developed this appalling habit of compulsive littering, as though the entire country was one huge waste bin. But the question I want to raise is, why doesn't the Indian Railways provide waste bins in every compartment, or at least in every coach? In the total absence of such bins, the only option is to cheerfully chuck your waste through the window. To expect us litterati to cling to our waste till we reach a station, and then go looking for a bin on the platform, is asking for the impossible! I am contemplating writing to the Railway Minister, requesting him to introduce bins in all long-distance passenger trains, but whether he will pay any heed, is a million dollar question! Any other bright ideas? I completely agree! I recently faced a similar situation in a local train, where a woman was trying to force a big plastic bag through a tiny hole of the window "Jali" (netting). I watched her struggle for 5 minutes, trying to poke that bag through the tiny hole and finally told her, it would be an easier exercise to drop the bag in a dustbin, when she gets off at her stop. The railway authorities seem to have the same answer about not placing dustbins- and that is Safety precautions. Unfortunately, dustbins are easy places where explosives can be hidden, without anyone checking. And explosives in trains, railway stations and even footpaths can cause large scale havoc-which is basically what terrorists aim for. 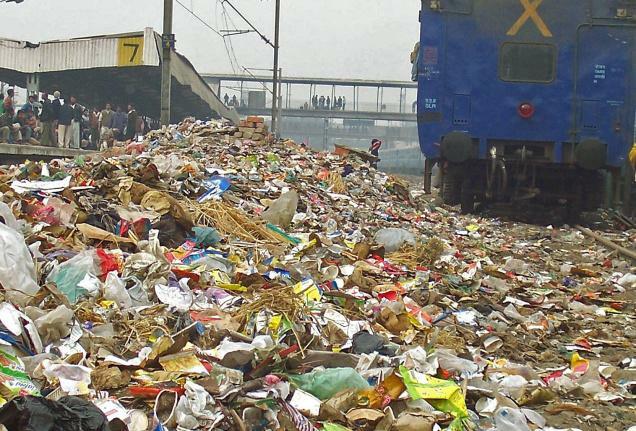 The government should start with trains such as the Rajdhani & Shatabdi.As food is provided in these trains, so they actually have an account of the number of bottles, tetrapacs, aluminum foil that will ultimately be discarded.Once they work out a system there... they can implement similar systems in other trains. And of course... the Junta need to be given a major wake up call, there need to be stringent laws against littering and spitting. Unfortunately for India, we are a country with many problems... waste being the least of them.